Research vessel (R/V) Falkor will return to port today after 28 days at sea conducting pioneering studies including mapping the Earth’s newest island landscape in the Kingdom of Tonga (Southwestern Pacific). NASA has partnered with Schmidt Ocean Institute and Columbia University to produce a high resolution submarine topographic map of the undersea portion of a volcano that first appeared in January 2015 as a result of a “surtseyan” style eruption involving the dynamic interaction of hot volcanic materials and sea water. 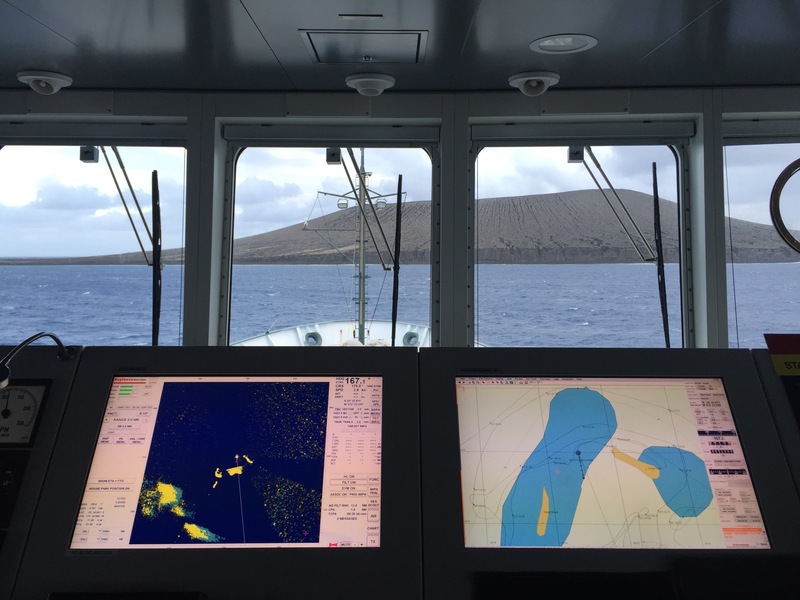 R/V Falkor was able to map a large region around the new island, which is unofficially called Hunga Tonga Hunga Ha’apai. Schmidt Ocean Institute’s R/V Falkor conducted high resolution undersea mapping in collaboration with NASA, as a mission of opportunity in conjunction with the Vent Life Expedition exploring ecosystem dynamics of the hydrothermal vent fields in the nearby eastern Lau Basin. This survey contributes to the project to extend satellite-based measurements that NASA’s Earth Sciences Program began in summer of 2015 with collaborators from the National Geospatial-Intelligence Agency (NGA) and the Canadian Space Agency (via their Radarsat-2 satellite), as well as the German Space Agency (DLR). Because much of the landscape dynamics associated with new oceanic island volcanoes happens underwater, this unique project of opportunity provides scientists at NASA and Columbia’s Lamont Doherty Earth Observatory with an integrated view of the three dimensional character of the new island from the seafloor to its approximately 130 meters tall summit above sea-level, all at spectacular meter-scale resolution. 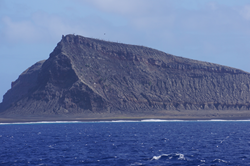 This topographic viewpoint will serve to better understand how such rapidly-formed volcanic islands evolve and why their long-term survival as land is often so limited and short in duration. It will also contribute to understanding of hydro-volcanic processes on planets such as Mars where similar-appearing volcanic structures (i.e., to the new island in Tonga) have been observed by NASA satellites such as the Mars Reconnaissance Orbiter (MRO). R/V Falkor has excellent high-resolution mapping capabilities, and has recently discovered several new underwater features such as the recently named Falkor Seamount. Falkor’s bathymetric mapping capabilities were able to be rapidly deployed to map a large region of complex seafloor topography around the new island, which is unofficially called Hunga Tonga Hunga Ha’apai (HTHH) on the basis of nearby pre-existing islands in the Kingdom of Tonga. Preliminary analysis by Columbia University scientist Dr. Vicki Ferrini, together with NASA scientists from the Goddard Space Flight Center, have showcased why the new island has lost nearly 30 percent of its initial land area in only 15 months since the eruptive activity ended in late January 2015. Just as at Surtsey island in the North Atlantic Ocean (near Iceland), the submarine topography around HTHH clearly exerts a controlling effect on the pace and location of erosion due primarily to marine abrasion and local subsidence. Scientific collaborations forged on the basis of common exploration interests such as those illustrated in Tonga enable serendipitous discoveries that contribute to scientific understanding of key systems on Earth, of which highly “sensitive” oceanic islands are but one example. The rapidly and effectively orchestrated seafloor mapping campaign enabled by the crew and science team on board of Schmidt Ocean Institute’s R/V Falkor has already provided new scientific insights and inputs into NASA’s project for understanding the evolution of newly-formed oceanic islands (such as HTHH) and clearly demonstrates the powerful spirit of collaboration that is a hallmark of science worldwide*. BROLL and Images can be found here. *It is anticipated that preliminary scientific outcomes from this collaboration will be presented during 2016 at major scientific conferences, including the Fall American Geophysical Union (AGU) Meeting. R/V Falkor Lead Marine Technician Colleen Peters of SOI and Dr. Vicki Ferrini of Columbia’s LDEO led the Falkor-based scientific investigation that was able to deploy to the region around the HTHH island in Tonga. The principal investigator of the ongoing NASA investigation of the new island and its evolution is Dr. James Garvin is the Chief Scientist at NASA's Goddard Space Flight Center. Schmidt Ocean Institute’s Lead Marine Technician Colleen Peters facilitated the partnership that enabled the seafloor mapping campaign, with assistance from a colleague at the USGS Hawaii Volcanoes Observatory (B. Shiro) and with help from the coordination manager of the NASA project (K. Andersen). All seagoing scientific operations on R/V Falkor were supported by Schmidt Ocean Institute. Funding for this research was provided by the Division of Ocean Sciences’ Biological Oceanography program under award number 1536650.